Use this agreement to buy or sell all the shares of any private limited company in a straight forward cash deal. This is an agreement for a simple sale and purchase of a private limited company. The deal is for full payment to be transferred on the day that share ownership is changed. There are no provisions here for conditional payment depending on future performance, for transfer of leases for business premises, or for dealing with subsidiaries. The business of the company is not important to this document. It could provide services to other businesses, or import and sell goods to consumers. 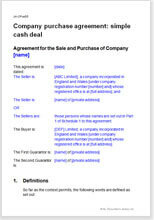 This document deals with the sale of shares. We include many optional warranties that are designed to protect a buyer with imperfect information about the state of the business. If you are the buyer, you should leave these in place where relevant because they give you protection against having not been told something that affects the value. If you are the seller, you may want to remove some of these so as to leave fewer points on which a buyer may subsequently come back and claim that you failed to disclose material information. Warranties are discussed in greater detail in this article. We also provide an example disclosure letter. We have provided a format as an indication of how such a letter works and a style you could use. We leave the detailed wording for you to add. The agreement complies with the requirements of the Companies Act 2006. If the business (or part of the business) is being sold, rather than the shares of the whole company, then you should use one of our business sale agreements. These deal with the sale of assets. If you are only selling or buying some of the shares in the company, and not acquiring all of it, then one of these agreements should be used. "Wide array of options to choose from, and the opportunity to email for assistance in deciding. Knowing it was a legal viewpoint, and therefore sound advice."